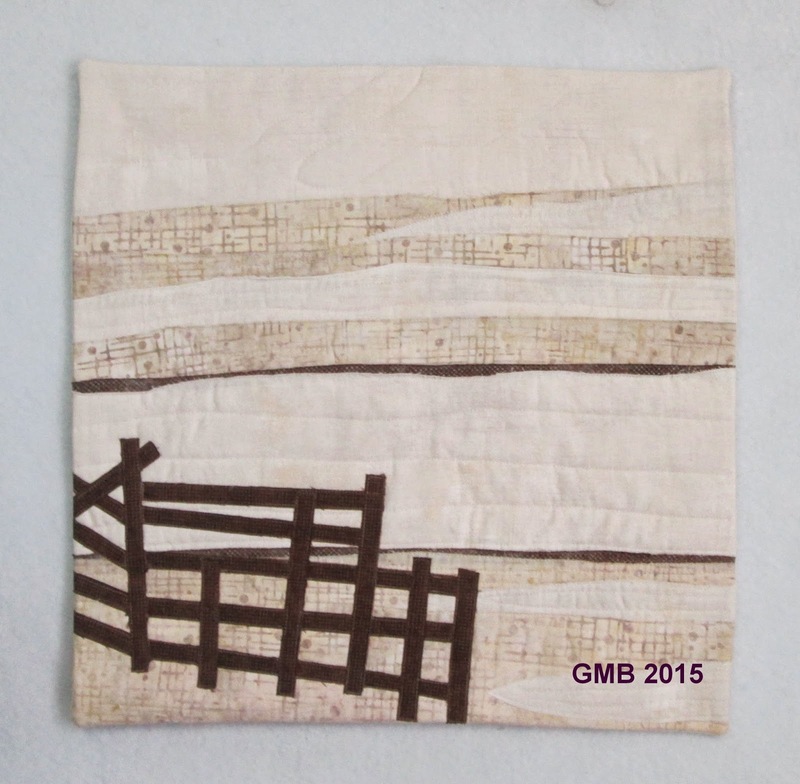 Margaret Blank: Thoughts from a Textile Artist: 1300! My next Blog Anniversary -- 12 years of blogging -- is exactly a week from today. Who'da thunk it? Certainly, I'd not even thought of how many posts I'd make between then and now...and yet today marks my 1300th post! That's an average of 108 posts a year...or just about one every 3 days for over a decade. Blogging has completely satisfied my 'writer's itch', and given me both a way to share my life and work...and an abundance of new contacts, some of whom have become fast friends. Thanks to all of you for following and reading and commenting, laughing, crying, comiserating, and sharing cyberspace with me all these years. 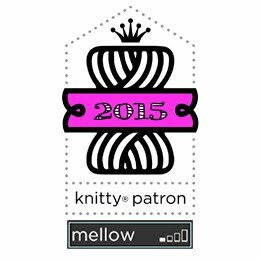 I began this blog as "The Lady Who Knits on the Bus", and my original URL, 'knitsonthebus.blogspot.com' will still direct you here, to a blog that began with knitting from a blogger who still has knitting in her life every day. And...as promised, this morning I used a random number sequence generator to pick the winners of the yarn I'm giving away in celebration of another long-time blogger, the Yarn Harlot. Congratulations to Christina V., Rhoda F., and Rav's GeneHunter! These Gentle Readers have been contacted by e-mail and their yarn will be sent out to them later this week. Now it's February...and in my books, that mean's only about 6 more weeks of winter, regardless of what the groundhog has to say about it tomorrow! interpretations of the challenge theme, "Monochromatic". Even though I'm taking a year off from the group to do my EBMC, I felt right at home with my first EBMC assignment which was...um...yep -- a monochromatic value study! My 15 x 15 friends have also been experimenting with snow dyeing. 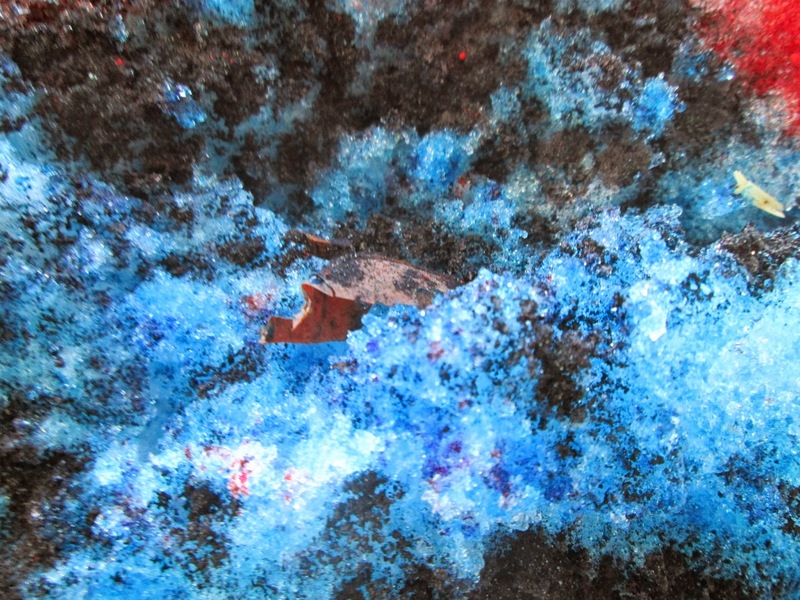 Many of them live where snow is a rarity, and recent aberrations in weather have found some of them out in their yards with plastic bags, scooping snow into them to keep in the freezer so they could do some snow dyeing! I'd wondered how this would work out, as I'd only ever done snow dyeing with powdery fresh stuff. I figured the stuff in the freezer would get hard and crystalline....just like the "old snow" that was in my yard. Until Friday, we hadn't had fresh snow for several weeks, and what we had was now hard-packed, with an icy crust from rain and freezing rain on top of it. I decided to dig out some and see results I'd get with it. First, I needn't have piled on the amount of snow I usually use, because this hard, crystalline, icy stuff takes longer to melt than the powdery version. I ended up dumping a lot of snow because I wanted to avoid a mess. Even though my fabric was on a rack in the bottom of the tub, the amount of snow melt would have resulted in "mud" instead of beautiful mottled colour. 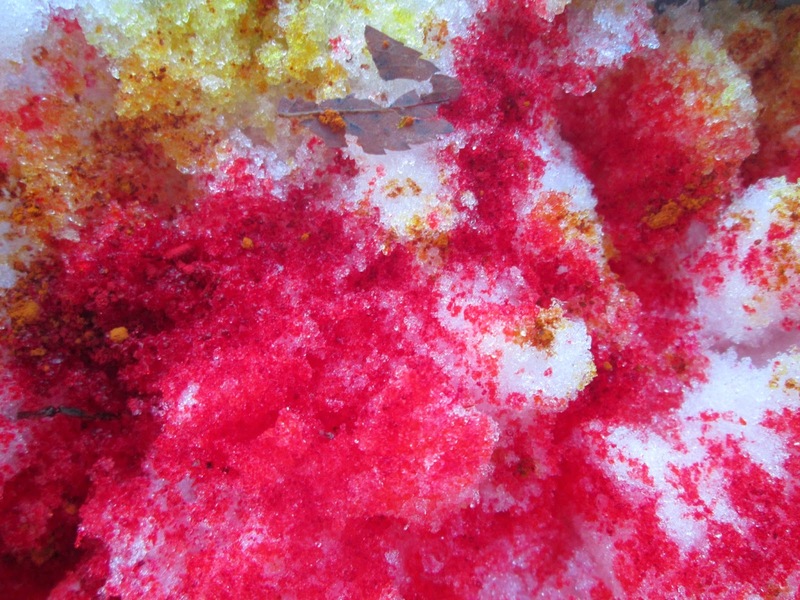 Second, "old snow" has bits of leaves and twigs in it, as these close-ups of the tub of dye-on-snow show (look carefully). 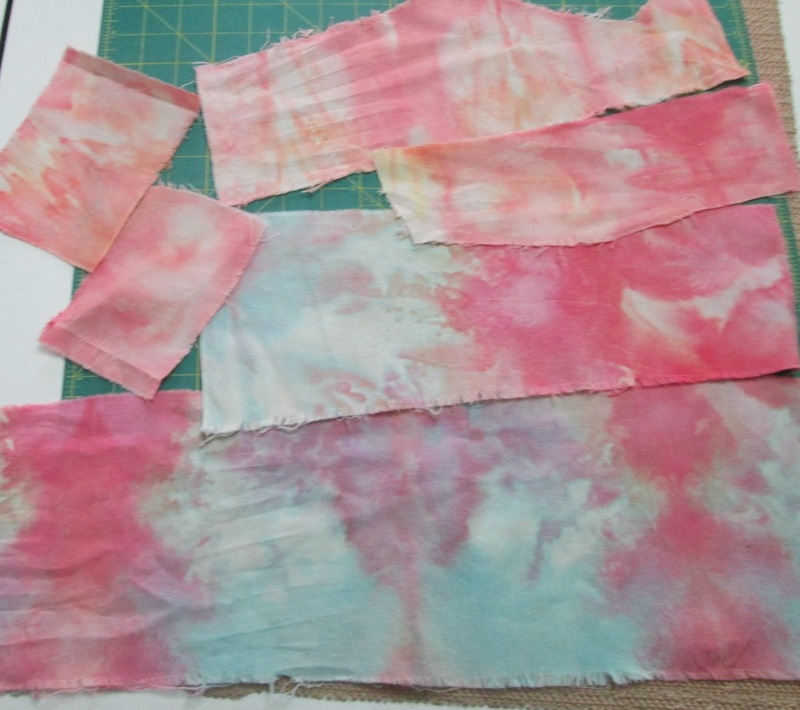 I have nothing specific in mind for these pieces yet, but I'm glad I found the delights of dyeing with "old" snow...and now I better understand why artists in warmer climes go to the trouble of dyeing with ice or freezer-kept snow. The results can be spectacular! Happy February, everyone...have a lovely Sunday! Thank you so much Margaret and congratulations to the other two winners! Love your snow dyeing results. 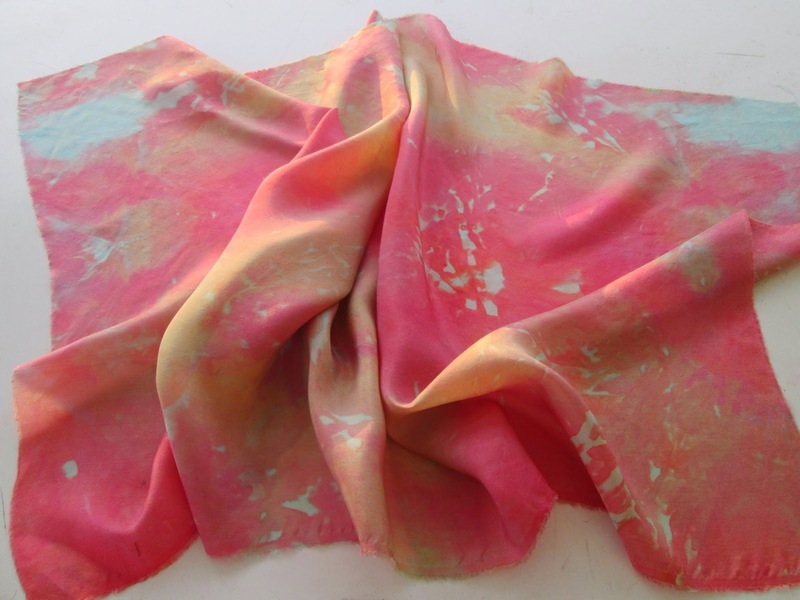 I have a lot of snow dyed fabric and really need to get the creative bug back. Enjoy the rest of winter. I love your monochromatic study, so simplistic yet so many stories come to mind. Many Congratulations Marg, and I am gob-smacked at the number of posts you have done. Concentrated commitment and a strong sense of community have been demonstrated in your blog posts... meaningful to many. 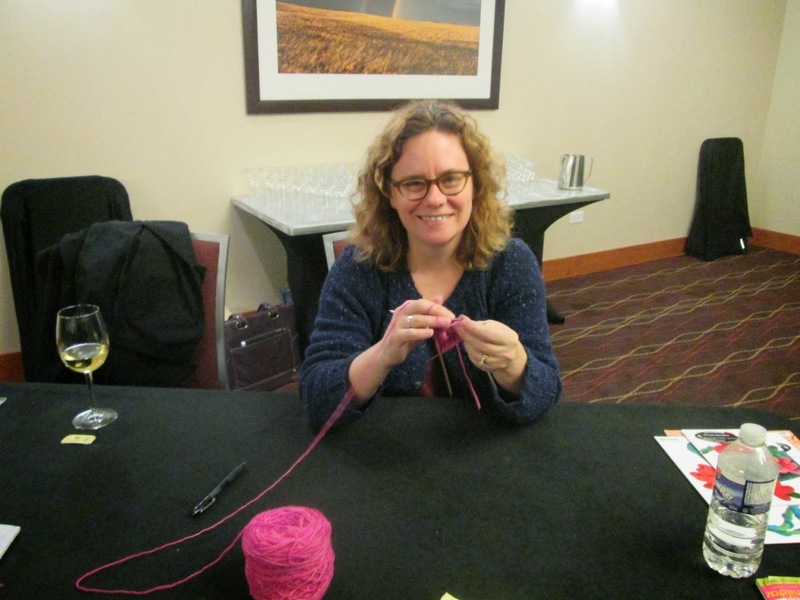 Knitting to fibre arts! Hooray! Enjoy the next 1300... I will be there reading along. And best wishes for a great next project with EB. I, too find blogging fulfilling. Congratulations. The snow dyeing looks fantastic! Wow I was so impressed about the number of blogs you have posted in all these years. It certainly gives you new friends. What a beautiful result of the snowdying. 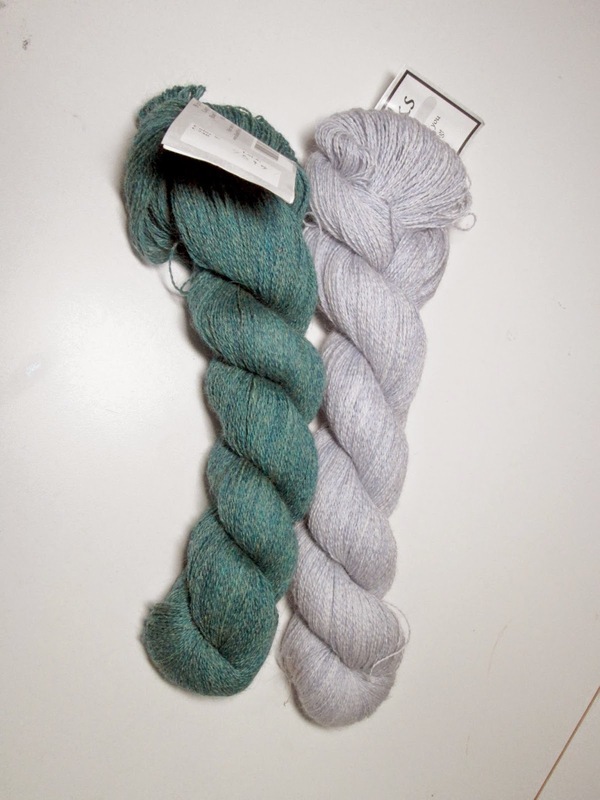 Lovely results from the snow dyeing. The silk is a treasure. I LOVE the silk! It is exquisite! The snow dyeing is gorgeous. I may have to find a way of doing it with ice.